Office Location: Saint Clair Shores, MI. Employees can also work full time from this office. WSM is an established industry-leading technical services and solutions integrator undergoing a rapid growth phase due to demand for our cloud adoption, migration, transformation, security and DevOps services. We offer virtually unlimited career growth potential for talented and motivated developers, systems engineers and server administrators. We thrive in a casual, open, friendly and collaborative environment. Our work is rewarded with very good pay and an awesome benefits plan including health, term life, short and long term disability, 401k with company match (yeah! ), profit sharing plan, equity program, dental, vision and flexible PTO. This is a full-time, 40 hour/week position. You'll help plan, architect, consult and execute on a wide range of workload, application and data/cloud migration and DevOps related projects, working both independently and as part of our systems engineering team. Working knowledge of networking infrastructures, including LAN, WAN, VPN, Virtual Network, Subnet, etc. Experience with DB's such as SQL, Oracle, etc. 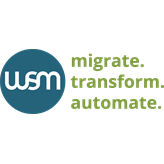 WSM is a solutions integrator with a core focus on migration and transformation services. WSM pioneered the migration services industry in 2003, and today is the largest specialized migration services provider in the world. Our team of business analysts, consultants, architects, data migration engineers and software developers have tens of thousands of hours of experience in planning and executing the migration of servers/workloads, applications, and complex IT infrastructures. As an SI focusing on migration and transformation services, we are not limited to pushing a single tool or solution to accomplish every migration project. WSM's consultants and migration engineers develop a custom detailed project plan for every migration project. Our migration plans may involve one or many different cutting-edge software solutions coupled with industry leading professional services to ensure uptime requirements are met, the migrated applications/workloads are fully tested, secure, and ultimately fully functional at the target environment.